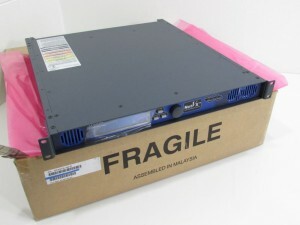 NEW Harris SYS-350-AC NetVx Video Networking System *Base Chassis* in Stock! NEW Harris SYS-350-AC NetVx Video Networking System *Base Chassis* for US $995.00 with Free Shipping and a 90 Day Warranty! Description : Harris SYS-350-AC NetVx video networking system. The NetVX video networking system is a modular video networking device. The modular design supports a wide variety of application-specific configurations. The NetVX SYS-350 is a 1RU chassis containing an internal system controller and slots for up to three user-serviceable application modules. forward error correction (FEC) and can be “tuned” to optimally address network-specific conditions. re-routed in real time on an as-needed basis without affecting any other cross connection. Unit comes with mounting backets. Free Fedex Ground Shipping in the lower 48 States. Harris SYS-350-AC NetVx Video Networking System for sale at Northwest Remarketing. This entry was posted in Harris and tagged 1RU, ATM, Base Chassis, cross connection, FEC, Harris, interface, IP, NetVx, networking, northwest remarketing, nwrusa.com, PDH, SONET, SYS-350-AC, Video Networking System on June 5, 2014 by nwrusa.